The final phase of this three-tower vibrant new community project near a major west-end transit hub by Tridel is coming soon and it won’t disappoint. 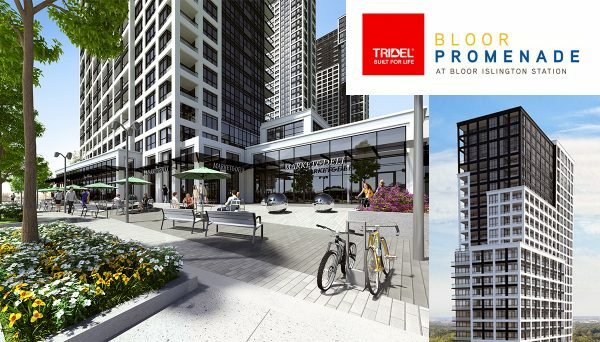 With landscaped grounds, luxurious amenities and a vibrant neighbourly atmosphere, Tridel’s latest condominium in Etobicoke is set to heat up the Islington City Centre district in a major way. Bloor Promenade Condos is slated for occupancy in 2021. 64 Cordova Avenue – the future site of this new building - is a sidestreet just north of the Bloor Street West and Islington Avenue intersection, mere steps from Islington Station. It’s a contemporary mixed-use development if ever there was one, which will eventually include three condominium towers, townhomes, retail shops, an expansive landscaped courtyard and direct pedestrian access to Islington subway station. This is the third and final tower to be proposed for the Islington Terrace project and will contain 395 units. At 44 storeys, it’s also the tallest out of all three structures. All the condominium towers will be connected by a two-storey podium, which will contain retail space along the Cordova Avenue frontage. Along the Maybelle Avenue frontage, which stretches west of Islington, the development takes on the character of the street and calls for a row of three-storey townhouses. Each townhouse unit will have a front door directly accessing the street. These units are set back from the street, which will allow a row of trees to be planted along the sidewalk, and for the sidewalk itself to be widened. Meanwhile, both the townhomes and the condominium towers will be connected by granite pathways that converge at a central landscaped courtyard. The courtyard will contain landscaping, water features and plenty of casual seating areas, making it a great place to chase the kids around on a Saturday afternoon or unwind with friends and a cup of coffee. This condo building is being designed by Kirkor Architects and features a contemporary design with a vertical breakup, adding texture and architectural appeal to this Etobicoke development. The majority of units here will be spacious two-bedrooms, and fittingly, amenities are geared just as much to families as they are to the social single professional. The top floor of the complex’s podium will have a selection of outdoor amenity space, including sections for private dining, lounging areas and a splash pad and play area for children. This expansive outdoor space will connect to indoor amenities, which includes a party room with billiard tables, a wet bar and stylish, yet cozy seating enclaves. You’ll also find an indoor children’s play room, a fully-equipped fitness centre, and indoor pool and hot tub. In total, this development includes an extravagant 50,000 square feet of amenity space. Whether you need a space for your children to explore the limits of their imagination, an expansive dining area to throw a family dinner, or a quiet oasis to recharge your mind and body after a hectic workday, there’s a place to do it Islington Terrace. Islington City centre is rapidly becoming the place to be. This is why this shimmering beacon is part of the new grand Islington Terrace Master-planned Community. This west-end location puts you right at the center of a major transit hub, while quaint shopping districts, lush parks and up-and-coming urban pockets are only minutes away. subway station connects you to the subway line – which will get you to the heart of downtown Toronto in 30 minutes – as well as an abundance of regional bus connections and the GO system. Just a short drive south to the Gardiner Expressway means that driving into Toronto’s Financial District takes under 25 minutes and most of the GTA is easily accessible as well. Both Bloor Street West and Dundas Street West are steps away, so shopping, eclectic dining and lifestyle amenities are never in short supply. Forget you’re even in the city with a trip to Tom Riley Park just steps away. Here you can stroll interrupted through lush pathways under treetop canopies, as Mimico Creek gently winds its way alongside you. The park connects to the Islington Golf Club at the north end as well as the Etobicoke Collegiate Institute. Islington City Centre is a truly unique location where neighbourly warmth, lush suburban greenspaces and urban amenities converge. Get a head start here before the secret’s out! As an extra perk, this development is also part of Six Points, once a nondescript network of major streets and off-ramps that's in for a major revitalization. The city has invested $45-million into transforming this pocket into what will eventually be a walkable, green and enticing area. Some of the upgrades planned for this tiny neighbourhood include a brand-new community centre, widened sidewalks, parkettes, trees, bike paths, public art and upgraded roads. Once finished - this will likely take about three years - the revitalization will add significant value to the neighbourhood. Tridel is largely known as a leader in eco-friendly development within the GTA. They’ve been building for 80 years, and in some circles are credited with premiering the concept of condominium living before it was a popular housing alternative. They’ve worked hard in the past decade to establish themselves as a go-to firm in “green” building initiatives, striving to have each of their high-rise developments LEED-certified, which is only designated when a building meets certain standards of sustainable design, construction and building functions. 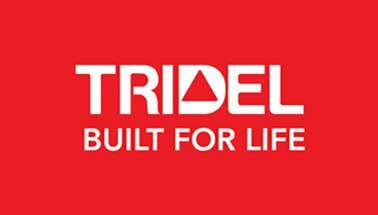 In ten years, BILD has awarded Tridel their “Green Builder of the Year” award seven times.